This page tells you the main types of floaters we see. By reading this page carefully, you may be able to obtain some idea of the type of floater you have and the success rate in treating it. But a patient's classification of their own floater is rather uncertain. An ophthalmologist's evaluation is more certain, but because this procedure is almost unknown, the only certain evaluation for what can be done is by a surgeon who performs this procedure. The overall success rate when we treat a floater with the laser is about 92 per cent. However, the rate varies according to the type of floater. For the 8 per cent of patients who reported no improvement, there was no evidence that a procedure had been performed and no harm was done. (A) In patients 55 years or older, by far the most common type of floater is an isolated, fairly large one that is caused by a posterior detachment of the vitreous jelly. Most of these floaters are attached to the back wall of the detached vitreous bag. This type of floater usually appears as a vague glob to the patient, is difficult for them to draw, is seen immediately by the doctor, and is easily photographed. These floaters which were pulled off the back of the eye are soft and usually can be completely vaporized and do not recur. Our goal with this type of floater is to provide a permanent cure. With considerable experience and skill, they can be treated successfully in 98% of cases done. A Weiss ring is this type of floater. Several examples of this type of floater that we have successfully treated are shown in the "Before/After Photos" (see Menu on left side of Home Page of this web site. (B) In patients younger than 55 years the floater is sometimes dots and lines very near the retina that can not be treated with a laser. The floater is seen by the patient as distinct dots and lines (not a vague mass), is very easy for the patient to draw exactly, is quite bothersome to them, is usually difficult or impossible for the doctor to find, and is impossible to photograph. If you believe that you may have this type of floaters, we strongly suggest that you see your local eye doctor (see "Exam. in your city" page) before coming here. The important questions to the doctor are: "Can you see my floaters?" and "Is it very close to the lens or retina?" Remember this type of floater is tiny but appears big because it is close to the retina. If your doctor can't see it, perhaps I could not find it either, and could not treat it with the laser. However, for these floaters we can not see, we may prescribe a very safe eye drop used every other night, that reduces or stops the patient from seeing their floaters. I must examine each patient to learn if they are a candidate before prescribing the eye drop. (No pictures are shown because these floaters are too small to be photographed). (C) In patients 55 or younger, the most common type of floater comes from early, marked degeneration (syneresis) of the vitreous. 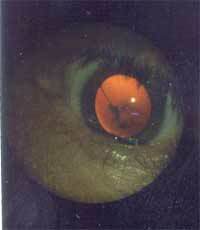 This degeneration does not lead to any problem in the eye except floaters. 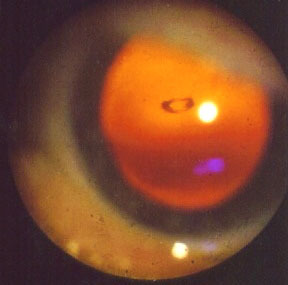 This degeneration is simply water slowly leaving the vitreous gel. When the water leaves, the formerly clear collagen architecture of the vitreous becomes visible as floaters. 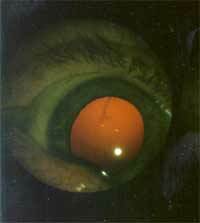 To the doctor the vitreous looks like a cob web with multiple thin silk threads, clouds, and clumps. If you are YOUNGER THAN 35 YEARS OLD, read carefully our web page Young Patients with Floaters before calling for appointments. If there are only a few small to moderate sized floaters, they can be treated individually with the laser with about 85 percent success. If there are numerous clumps, or the clumps are very large and free floating in the vitreous, they can not be completely removed with the laser. In this situation the goal would be to give the patient a significant improvement, not a complete cure. If the patient does not think the improvement is adequate, the floaters usually can still be removed with the vitrectomy operation which we do not offer, but there is significant risk. If a large degenerative clump is being suspended in the line of sight with one or two thin strands, we can frequently cut the strands. This allows the floater clump to relocate to another part of the vitreous outside the line of sight. This improvement is frequently dramatic. Success in this type of floater is 95 percent or higher (see example below). (D) There is another fairly common floater which I was the first to describe and have named a “Floater Duet.” It is combination of a floater pulled off the back of the eye by a posterior vitreous detachment plus multiple floaters low in the vitreous from vitreous degeneration which is described in first paragraph of the (C) section above. If the floater pulled off the back of the eye is the main offender in this duet, we can usually easily remove it with the laser. However, if the floaters low in the vitreous are the main offender from swinging up into the middle of the vision, we don’t do the case because such low floaters can not be reached adequately by the laser. However, these cases can be treated with the vitrectomy operation with its attendant risks. From inflammation--We do not offer the laser procedure if the inflammation is recent and may be recurrent. If the inflammation has been quiescent for years (for example in toxoplasmosis), we may offer the procedure. From asteroid hyalosis--These are bright, multiple (maybe 400) floaters that are not reduced by laser treatment but usually don’t bother the patient much. Occasionally these floaters form into clumps that disturb the vision. The laser can break up the clumps and make them less obstructive. 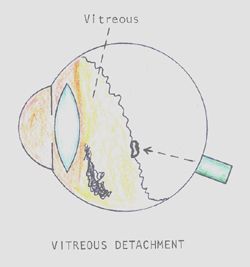 From hemorrhage--Most hemorrhage associated with a posterior vitreous detachment absorbs within three weeks. We don’t attempt to remove large blood clots with the laser.